This song – not quite a ballad in the usual early Schubert manner – illustrates why 1816 was very much a transitional time for Schubert. He had already written Gretchen am Spinnrade and Erlkönig, in 1814 and 1815 respectively; but despite these masterpieces, and a number of others, he was not yet ready to abandon his teachers altogether. He lacked the inner confidence of a young Mozart or Beethoven and it is doubtful whether he ever considered himself to be in their league. Salieri had been his teacher until recently, and the celebratory music the younger composer wrote for the fiftieth anniversary of the Italian’s arrival in Vienna seems more than a step or two down from the exalted level of creation of which he had already shown himself capable. 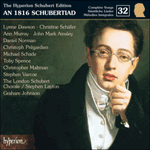 In a spirit of deference, affection and respect, Schubert tailored his musical style to the occasion, cutting his music of homage from a less richly-patterned cloth, even if today we may find the result skimpy by Schubertian standards. Zumsteeg was another of his teachers – neither officially, nor in person, of course – and in 1816 the nineteen-year-old Schubert was not yet ready to cut himself free from the Swabian composer’s influence. Ritter Toggenburg is evidence of a continuing interest in the tradition of the ballad as pioneered by Zumsteeg, and of a certain judicious modesty on Schubert’s part that the casual listener may find uninspiring. On the other hand, the Schubertian recognizes this as the product of an important side of the composer’s creative nature, the side that listened to others as carefully as to his own inner voices. By 1816 Schubert has settled down into what he knew would be a lifetime relationship; his love is no less intense, but it is more responsible and methodical, more aware of what has gone before. Like the great craftsman that he was, Schubert used 1816 to review the foundations on which he would build his fame, the musical bricks and mortar of the strophic song as constructed by his musical forebears. The strength that lies at the heart of the seemingly simple songs of, for example, Die schöne Müllerin, here has its beginnings. In a year of pulling-in of horns it is no surprise that the time of the big ballads was already almost over. These spacious, sometimes unwieldy, but never less than fascinating works were the early training ground for Schubert’s song-writing. 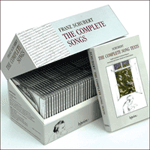 The great period of the Schubert ballad is 1811-1815 and, from the beginning, Schiller was a favourite collaborator. To the dramatic poems of this great playwright we owe some of the most febrile achievements of the composer’s youth: Leichenphantasie, Der Taucher, Die Bürgschaft, and so on. In comparison with those works we can already note a certain constraint in Die Erwartung (also Schiller) from May 1816 and also influenced by Zumsteeg. Ritter Toggenburg, in its economy and lack of extravagance, is a work even more typical of 1816, an example of Schubert’s continuing penchant for narrative poems of this kind. It falls between two stools: too long to be a song, it is too short to be classified as a ballad in the manner of Der Taucher, for example. In the extended static section which concludes Ritter Toggenburg, a strophic song is welded to the preceding narrative to make a hybrid form unlike any other in this composer’s output. The story of a gallant, yet hopeless, passion culminating in faithfulness until death may have appealed to the Schubert of 1816 for personal reasons. He was in love with a sweet-voiced singer in the Lichtental church choir, the baker’s daughter Therese Grob. Although the date of parting between Therese and the composer is thought to be towards the end of 1816, it is likely that the relationship had already run into difficulties earlier in the year. At this period of his life in particular, Schubert seems to have been able to work on texts of this kind as if his imagination was kindled by some aspect of personal identification with a poem. Perhaps for a while he saw his devotion as being endless – that he could win Therese simply by waiting patiently for her despite all the financial difficulties that made their continuing relationship unlikely. 1: The poet gets to the heart of the matter immediately with the words of the young girl (in inverted commas in the poem) whom Toggenburg passionately loves. She can offer him only a sister’s affection in return. The key is F major and the music in flowing crotchets is gently tuneful and demure. This is a young lady who has already set her heart on a spiritual life. The music is an example of Schubert’s medieval style. There are no obvious musical archaisms (he reserved touches of learned contrapuntal style for his evocations of the seventeenth and eighteenth centuries) but it is clear that his use of restrained chorale, the equivalent of a musical fast or renunciation, suggested the epoch of the Crusades. The austerity of hymnody was as near as a nineteenth-century composer could go to evoke the fourths and fifths of organum. (Time-travel into the Middle Ages was to be an early twentieth-century speciality, as in the music of Debussy and Satie as well as passages in Pfitzner’s Palestrina.) Schiller’s text tells the story with the minimum of fuss, and Schubert responds by making the pace of the action move faster than in most of the other ballads; only at the end of the piece does the logic of this become clear where the elongation of time is in contrast to its former telescoping. 2: After only a crotchet rest, the music changes into D minor, and the composer indicates a gradual accelerando (‘Mit steigender Bewegung’) as the mood changes from serene inaction to the very opposite. Within the space of a few bars Toggenburg has torn himself away and is on his horse, determined on deeds of derring-do. What the music lacks in depth it makes up for in terms of breathless pace. The introduction of off-the-beat quavers into the texture suggests a pulsating heart; a vocal line in crotchets doubled in both hands by the piano (at ‘seinen Mannen’) paints the rallying of manly determination, and crotchets in alternate hands at ‘Nach dem heil’gen Grab sie wallen’ a mixture of impatient energy and suitable religious awe. 3: This verse is introduced by a short Zwischenspiel in the manner of a pilgrims’ chorus, the basis for the musical setting of the following strophe. Here the music remains in plain crotchets and minims with a few enlivening details: a touch of chromatic colour at ‘Ihres Helmes Büsche’ and a belligerent left-hand dotted flourish after ‘In der Feinde Schwarm’, a motif which is to be found in other military songs like Schlachtgesang or Lied eines Kriegers. The awe-inspiring effect of the Toggenburg name on the Muslims is emphasized by a vocal line doubled at the octave in both the pianist’s hands. Even if we admit that the pilgrims’ chorus derives from Zumsteeg’s setting of the ballad, Schubert has made it his own. It is here that we see how closely the work is related to a song like Der Kreuzzug, a Leitner setting which dates from 1827, or Glaube, Hoffnung, Liebe from 1828. Even at the end of his life Schubert had not lost his taste for writing music which evoked German history or tradition in an idealized and romanticized fashion. This was perhaps one of Zumsteeg’s lasting legacies to our composer. Schubert’s final opera, the unfinished Der Graf von Gleichen, is further evidence of an abiding fascination with the medieval past. 4: The previous section ended in G minor. There is now a sudden change of mood and key. The rigorous crotchets which had cut the music vertically into sections are replaced by forward-moving quavers with a horizontal impetus. It is here that we realize that the whole of this piece is about the relative nature of time – how under some circumstances it drags and, at others, seems to slip away as one year melts into the next. The drooping elongated setting of ‘Jahr’ across an entire bar and the similarly graphic stretching-out of ‘ertragen’ and ‘länger’ are subtle indications of Toggenburg’s impatience. Once the knight has decided to leave his troops the music loses its grounded nobility and wanders chromatically – almost aimlessly – through various keys until it encounters a ship bound for home. A new key-signature briefly introduces the key of B flat minor which soon changes into a more optimistic D flat major. If Toggenburg is not exactly piped aboard, the sailing of the homeward-bound vessel is ceremoniously launched by a repeated sequence of rising thirds and sixths, in the opposite direction from Beethoven’s motif of falling horn music in his ‘Les Adieux’ Sonata. This is not only farewell to the East, it heralds the dawn of Toggenburg’s hopes for a new life. 5: The music moves swiftly between B flat minor and C major as a journey of many months is accomplished, door to door, in as many seconds. After these few bars of recitative the poor man’s hopes are crushed for ever. The stage is set for the return of F major, and once more we hear the opening music of rebuff (at ‘Die ihr suchet, trägt den Schleier’) which had sent him away to the Crusades in the first place; this time the words are not even spoken by the girl herself. This is a message unemotionally delivered and seemingly placidly received. Indeed, the shock of this news has left Toggenburg beyond tears, and the stage is now set for one of the strangest conclusions in all of Schubert’s lieder. 6-10: The music moves into triple time and is now marked ‘Langsam’. A six-bar interlude of solemn music in mournful mezzo staccato crotchets effects a modulation from F major back to the elegiac key of B flat minor which we have briefly visited earlier. Here the ballad turns into a strophic song describing the gradual demise of the patiently waiting knight. The fast pace of the rest of the song, where battles and journeys are all elided into the space of half a bar, now stretches into a timeless loop retracing the non-events of the knight’s vigil over a period of years. The music has a bel canto shapeliness about it, dignified and infinitely mournful; this is the music of self-effacing courtly love. The music modulates briefly into D flat major where we hear musical echoes in thirds and sixths of the knight’s former voyages and exploits; these do not arise because of the text, but almost despite it. But we soon return to the dying fall of B flat minor, and once again we embark on the strophic music. ‘Listen’, he said once, ‘to the song I have here’, and with a voice already half-breaking he sang Kolma; then he showed me Die Erwartung, Maria Stuart and Ritter Toggenburg; he said that he could revel in these songs for days on end. It seems that during this period Zumsteeg was able to make time stand still for the young Schubert, as well as for Ritter Toggenburg. Denn es macht mir Schmerz. Auf der Brust das Kreuz. in the country of Switzerland. the cross on their breasts. at the gate of her castle. she is a bride of heaven. the castle of his fathers for ever. tranquil and as gentle as an angel. it would be morning again. still gazing at the window.